Written and directed by Carlos Reygadas, Post Tenebras Lux (Light After Darkness) is the story of a posh Mexican family who live in rural surroundings as a man deals with his environment and class status. The film is an exploration into a group of people who are part of a certain world yet have desires and such that would have them removed from the people they‘re surrounded by. Starring Adolfo Jiminez Castro, Nathalia Acevedo, Willebado Torres, Rut Reygadas, and Eleazar Reygadas. Post Tenebras Lux is a haunting and mesmerizing film from Carlos Reygadas. The film is an impressionistic story revolving around a New Age architect and his family who live in rural Mexico in a posh home where they have poor/working class men working for them. Yet, it’s a film that doesn’t play into any kind of traditional narrative as it’s mostly non-linear where Juan (Aldofo Jiminez Castro) deals with his own status as he reflects on his life as he also thinks about what he wants for his family. Juan is a man troubled by his own desires as well as he seeks help but he would deal with his own issues as it relates to what he wants for his family as well as the people he meets who aren’t rich as some are envious of his status. The film’s script doesn’t play into any kind of traditional narrative in order to make it a film about memories and fantasies as there’s also elements of surrealism that comes into play. Carlos Reygadas’ direction is entrancing not just for the imagery that he conveys in its 1:37:1 full-frame aspect ratio. It’s also for the dream-like quality that he creates as many of the film’s exterior setting has these very impressionistic yet crystallized blurs around the frame with the middle of it being very clear. It’s among the many aspects of the film that is so unique not just in the way many of these exterior settings are presented but also a world that seems to be removed from reality or fantasy as Reygadas would shoot the film with these long hand-held and steadicam tracking shots for its opening sequence. Much of the film’s interior settings is shot without these impressionistic edges in order to present a blur with reality and fantasy. Two of these sequences involve a Christmas dinner and a strange sequence at a spa play into this idea of fantasy that Juan wants. The latter of which involve Juan and his wife Nathalia (Nathalia Acevedo) watching people having orgies in spas as it would play into the sexual frustrations that Juan deals with. Particularly in an earlier scene where he talks to one of his workers about that as it adds to that blur between reality and fiction. 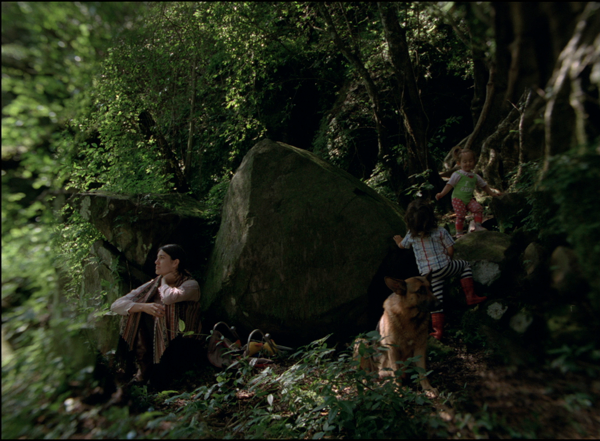 Much of the film is set in rural Mexico in its forests filled with beautiful trees and such while there’s a few scenes set in Europe to play into Juan’s posh background and the disconnect he has with rural Mexicans. The film’s climax not only involve what Juan has suffered through but also the strange connection he would have with one of his workers as it would play into the idea of faith and redemption. Overall, Reygadas crafts a very exotic yet chilling film about fantasies and its collision with reality. Cinematographer Alexis Zabe does amazing work with the film‘s cinematography from the ethereal colors of the Mexican exteriors in the forest and mountains to the rich look of the interiors with its low-key lighting and lush imagery. Editor Natalia Lopez does excellent work with its editing as it‘s mostly straightforward yet methodical as it doesn‘t play to conventional ideas of editing. Production designer Geraldo Tagle and art director Nohemi Gonzalez do fantastic work with the look of the house that Juan and his family live in as well as the poor home some of his workers live at. Visual effects supervisors Rodrigo Echevarria and Juan Manuel Nogales do superb work with the film‘s minimal visual effects such as the blurred edges of the camera as well as the mysterious red devil that appears in one major sequence of the film that plays to its surrealism. Sound designer Sergio Diaz does brilliant work with the sound work from the calm atmosphere of the forest to some of the raucous sounds in the parties and such that the characters encounter while much of the music in the film is played on location as it mostly features traditional Mexican music as well as a cover of a Neil Young song performed by one of the characters. The film’s incredible cast includes some notable small roles from Jose Alberto Sanchez as Juan’s head worker El Jarro, Suemi Valderrama as Siete’s wife Samanta, and Willebado Torres as Juan’s worker Siete who becomes envious of Juan’s richness. Rut and Eleazar Reygadas are wonderful as Juan and Nathalia’s kids as they play into the sense of innocence that is in Juan’s complicated world. Nathalia Avecedo is amazing as Nathalia as a woman who tries to deal with Juan’s sudden detachment as well as the world she encounters that includes the chilling spa sequence. Finally, there’s Adolfo Jiminez Castro in a phenomenal performance as Juan as this rich architect who deals with his own desires and what he wants for his family as well as his disconnect with the people he’s surrounded by as well as his wife which leads to his own sexual frustrations as it’s a very haunting performance. Post Tenebras Lux is a marvelous film from Carlos Reygadas. While it’s definitely not an easy film to watch due to its unconventional storyline and impressionistic images. It’s still a film that plays into the world of what men want in the world but also the disconnect they would have with their own surroundings. In the end, Post Tenebras Lux is a ravishing yet cerebral film from Carlos Reygadas.